With temperatures hovering mostly in the 40 to 50 degree range, January hasn't felt much like winter around here so far. But that's not stopping us from doing a few wintry Pinterest inspired crafts! We haven't quite resorted to cutting out snowflakes for the windows yet, but I did find this very cute idea for a ice skating scene. N., always up for a "project"! The idea was to use salt for the ice, cotton balls for the snow banks, and then cut out some figures to do the skating. We may have gone a little overboard with the salt. Looks a little more like a street in our neighborhood in anticipation for one inch of snow than a sparkling rink awaiting skates. We went through a few of N.'s coloring books and found some pictures that were winter sport related. Or just dancing, in Minnie's case, though she does look like she's doing some sort of figure skating move. N. colored them, I helped her cut them out, and then we glued each picture to card stock. I gave each one a little paper stand like a paper doll. And then N. got to playing with it. Figures obviously not to scale, but N. played with it on at least three occasions. This post is a part of the Real Women of Pinterest series. Go check out what mep and others are crafting as well! Oh, okay, we did have ONE day of a smattering of snow. 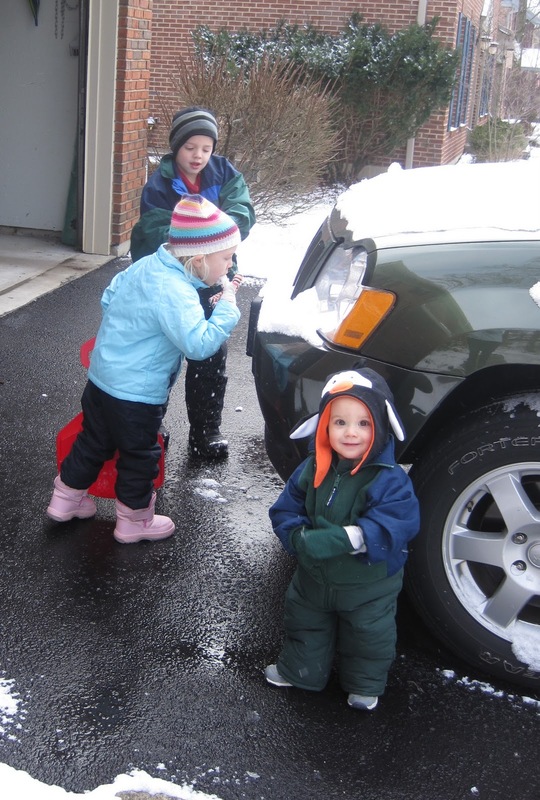 Barely enough to call snow, but the kids were excited, and it gave J. and I a reason to give the kids the sleds we bought them for Christmas but forgot were in the back of his car until the end of Christmas day. So, here are a few photos of the kids doing their darnedest to play in snow that was melting all around them. Moooom! These don't work at all! Ha Ha Haaaa! Mine does!! "I am cooold! Can I go inside and have hot cocoa now?" That Minnie always has the best moves. And I am a cotton-ball-spreader-outer-don't-waste-for-goodness's-sake kind of mommy crafter, too. Sigh. My favorite part of snow is the same as N.'s. Hot chocolate, mmmmmmmmm. 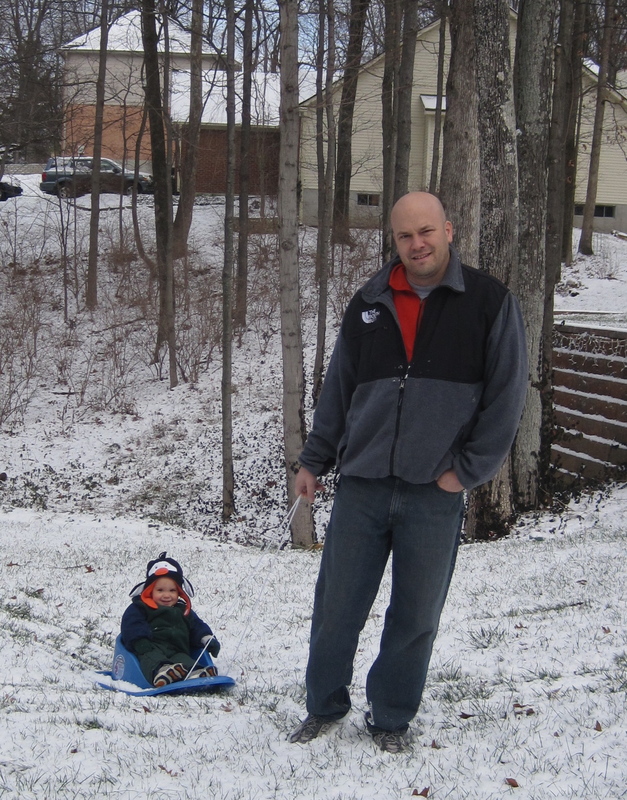 LOVE the sled riding pics; Gabe gave it a try that day, too, to no avail. We're hoping for at least one big snow this year; we have a great hill just across the street by the animal shelter that we love to race down! I, too, am a frugal crafter. You never know when you'll need that particular supply again (in my mind, at least). Love the "snow" pics. We could take some real snow pics around here today, except that I'm so strung out from single parenting that I don't see any fun in the snow in our future until I've had a decent night's sleep. I'm not sure if I'm a frugal crafter or a go-big-use-it-all -- think it depends on the trouble required to replenish a particular item. As for cotton balls, I'd have let the kids go nuts. A couple of years ago, I hosted an at home snow-themed (??) birthday party for Bub. I planned a bunch of games, including a snowball fight with cottonballs. But then the kids all played in our bathroom and/or with Bub's toys so we didn't play any games. Very cute craft! Our streets look like that here when they think it may snow an inch, too, lol. I'm thinking the next day the kids have off school, we may try this one. My girls would just love it. Loved all the pictures of the snow. 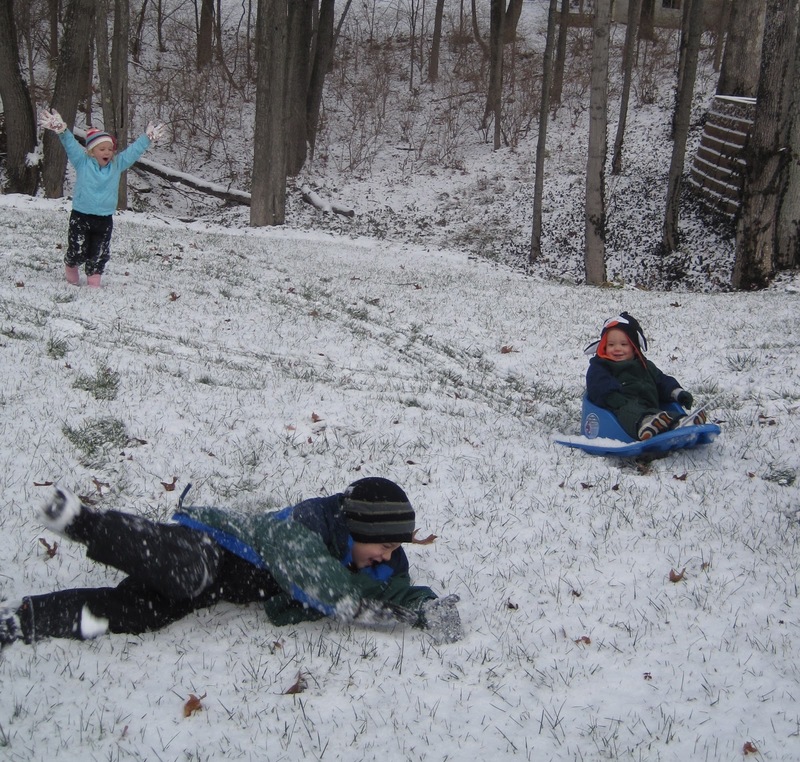 We got about that much last week and my kids were dying to go sledding! Visiting from the RWOP linky. Visiting from RWOP. We have been teased with the idea of snow, but just nothing great yet. And this rain today...seriously? I also wouldn't have wanted to waste the cotton balls...I get it! Real Men Do Pinterest Too.